In two posts, I answered some common rules questions about fifth-edition Dungeons & Dragons from dungeon masters and players. I added some extra comments on the answers because that’s what I do here. Since posting my answers, more game play has sparked some new observations. What spells can I cast? As I introduced players to the game, the what-spells-can-I-cast question was asked a lot. I struggled to find a concise explanation until I arrived at this metaphor: The spells you prepare become the menu of spells that you can order from through the day. Your spell slots tell how many items you can order from the menu. If you really like Magic Missile, and you have it on your menu of prepared spells, order as many as you like until you reach your limit of slots. How do opportunity attacks work? You only provoke opportunity attacks when you move out of an enemy’s melee reach. This change seems minor, but it alters tactics. Your front line becomes less sticky than in earlier editions. 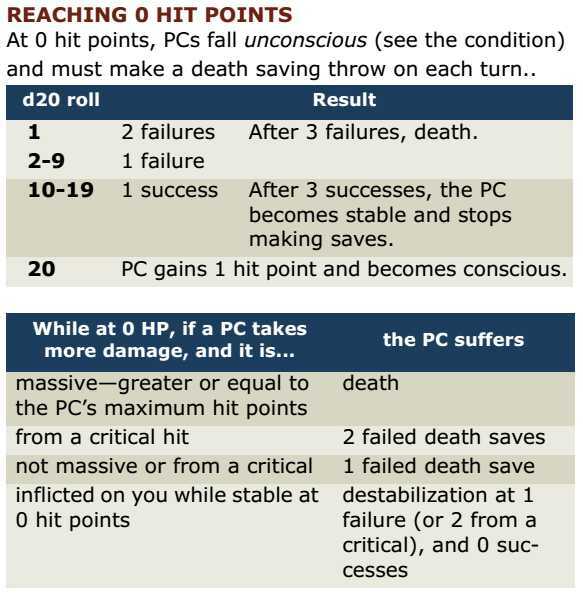 Concentrating attacks becomes easier as characters in a party’s middle ranks grow more vulnerable. An attacker can circle your tank and potentially attack the wizard in the next row without provoking any opportunity attacks. Can I delay? No. Back in my year-old post of D&D next questions and answers, I commented on the lack of a delay action in the rules. I even asked Mike Mearls about the absence and he thought the lack might even be an oversight—the product of playtest rules in flux. I predicted that the delay action would return to the final rules. I was wrong; delay is gone. For a while, I puzzled over the omission, but then a player at my table got paralyzed by a Hold Person spell, and the designers’ motives became obvious. Delay may seem trivial, but the ability to delay forces the game to add rules for how delay interacts with effects that end during a player’s turn. On several occasions, I’ve seen fourth-edition players try to salvage their turn by asking if they can delay until, say, a stunned condition lifts. Fourth prohibited such shenanigans by including rules for how delay interacts with conditions that continue to end of turn. Fifth edition potentially added another layer of complexity by adding concentration. For example, Hold Person requires concentration. This means that someone held can potentially delay, saving their turn and hoping that their allies can break the caster’s concentration. By removing delay, 5E prevents such tricks and eliminates some complicated rules. This entry was posted in D&D fifth edition, Rules and tagged delay, Mike Mearls, opportunity attacks, questions & answers, spells. Bookmark the permalink. Good choice about delay. But why not eliminate turn order and make play simultaneous?